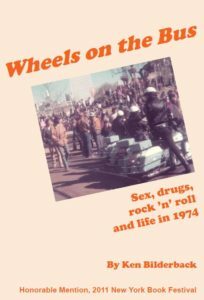 The following is an excerpt from Wheels on the Bus Copyright 2011 by Ken Bilderback. All Rights reserved. This particular story happened a few days after Halloween, 1968. I had gone to the lunchroom at school and waited for my friend David to join me to exchange leftover Halloween candy. David was my best friend in those days, a quiet but happy kid with a complexion even pastier than mine. In fact I remember his skin as white more than flesh-colored. David came from a dirt-poor family, although he lived in a nicer house than I did. David and I had things in common, like never wanting to go home, and never wanting to talk much about his personal life. Instead we talked about cars and about the little Revell models we were building. I liked muscle cars, while David was partial to things like the Munsters mobile and Batmobile. David didn’t join me at lunch that day, which surprised me because we had talked about it just an hour or so before. I figured he had gone home sick, which wouldn’t be surprising because he was sick a lot, often throwing up. When I got home a few hours later I plopped myself on the davenport to watch “Where the Action Is” or “It’s Happening” or one of the rock ‘n’ roll shows I could watch only when my father wasn’t home. On this particular Tuesday afternoon, my mother came from the kitchen with a worried look on her face. Someone from the school had called because they knew David and I were friends. David’s mother, it seems, had picked him up at lunch time, along with his little brother and sister. A couple hours later, one of David’s neighbors saw exhaust seeping from the garage of David’s house and investigated. Soon after police found David, his mother and his four siblings in the back of the family’s station wagon in the garage, all dressed in their pajamas, and all dead. I imagine I cried a little, but mostly I was stunned. None of this made sense to my 12-year-old mind. My main question was not “why?” but rather “why were they in their pajamas?” Looking back, I think that was about as deep as I wanted to get to solving that mystery. I stayed on the davenport all evening that night instead of retreating to the basement because Walter Cronkite was on the old black and white Columbia television, reading the results of Richard Nixon’s victory over Hubert Humphrey in that day’s presidential election. “There’s news besides the election,” Cronkite said at one point, or words to that affect. “We have word from Detroit that a mother and her five children were found dead in the back of their car, all dressed in their pajamas, dead of carbon monoxide poisoning.” I sat on the davenport, hands tightly gripping the frayed fabric upholstery. I learned later that David’s parents had both lost their jobs months earlier and were getting a divorce. I never did learn why they were wearing pajamas at noon. My mother had me sit on the davenport the next day or so to explain why she wouldn’t let me be a pallbearer for David’s casket. I wouldn’t be able to handle the “trauma,” she told me. I asked her what a “Paulbearer” was and didn’t understand what her answer had to do with people named Paul. I protested a little, but not a lot. The fragile little boy on the overstuffed davenport had moved on from David’s death. I still had assassinations and such to worry about.